A lot of new beauty booty crossed my desk this month. Some items were cool, some were kak, but I thought I’d focus on a few of the goodies I liked best, the first being GOSH Kiss Me! moisturising lip balm, R99, selected Edgars and Red Square stores. Available in six shades, this hydrating, unscented lip balm crayon is kind of like a less pigmented, non-stain-y version of Revlon’s Just Bitten Kissable lip stains. I love how it goes on nice and smoothly, feels like almost nothing on your lips and yet the colour doesn’t slide off your lips the moment you crack open a Coke Zero. GOSH Kiss Me! moisturising lip balm in Hot Kiss. The best bit, however, is that the shade I was given, Hot Kiss, makes wearing red lippie all too easy in that it goes on nice and sheer. I’ve always avoided red lipstick in the fast as I felt it looked too severe against my pale skin and created the illusion of smaller looking lips. This is why I’ve only ever worn sheer red gloss like MAC’s lipglass is Venetian. GOSH’s lip balm, however, is another item that delivers a zexy red pop without looking too harsh or opaque so it’s become a handbag staple. Now for the bad news: This is a limited edition item that launches in February. Insert sad face here. So, I’m most definitely going to stock up and buy another of these the moment it hits the shelves and hope to God they sell so well that GOSH decides to keep them as a permanent part of their line up. Another lip pencil to love? Rubybox Beauty Smooch Stick, R129,95, rubybox.co.za. The beauty sample box brand have created their own in-house beauty line, Rubybox Beauty, which is currently pretty small but is sure to grow. 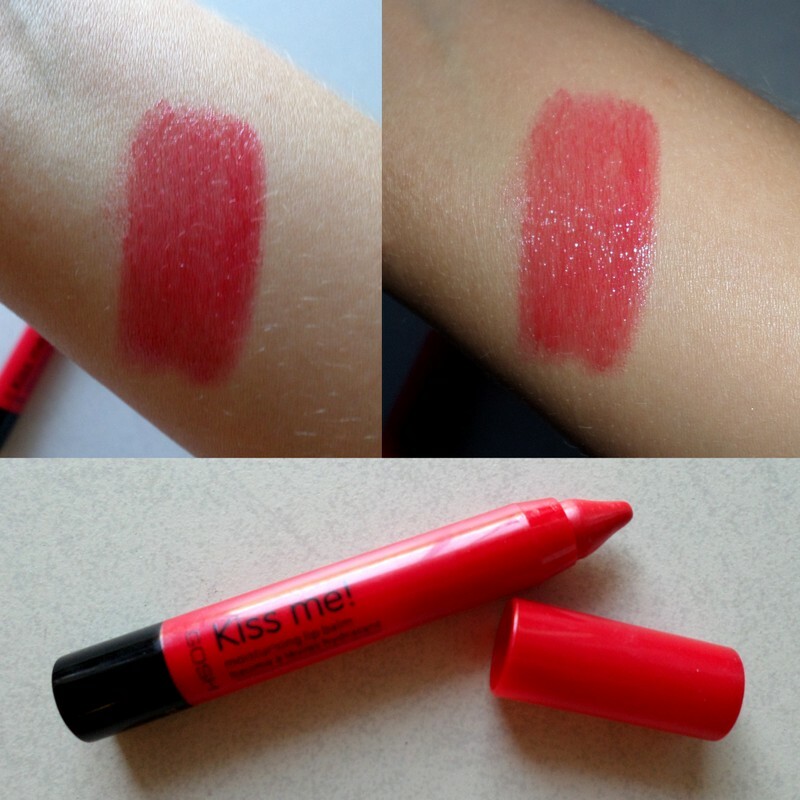 One of their newer products is a lip crayon available in just one shade, Tangerine Tango, a bright summery orange. 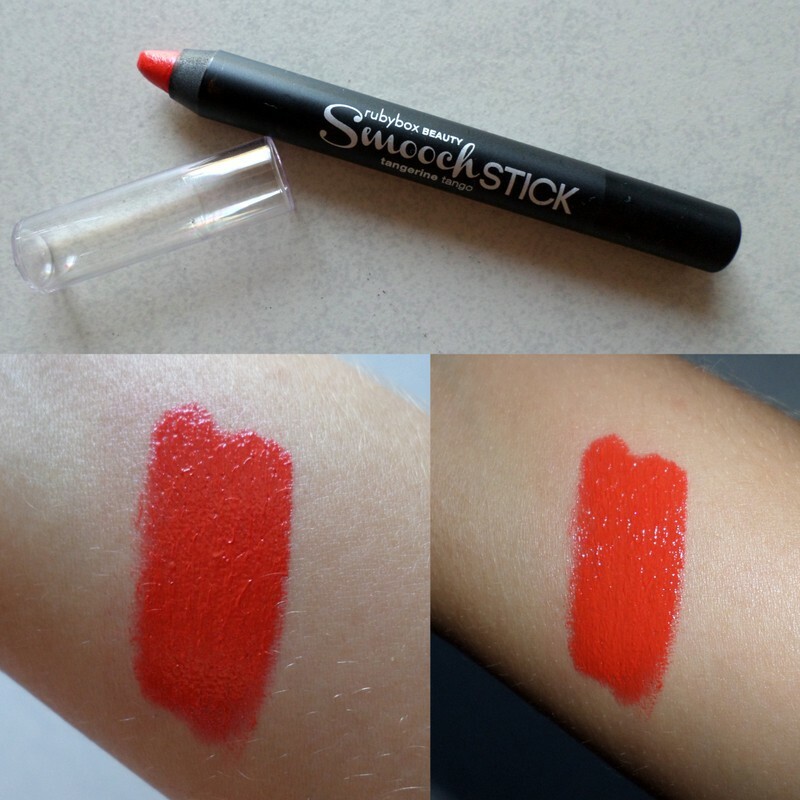 Rubybox Beauty Smooch Stick in Tangerine Tango. Alas, this colour doesn’t really work for me, I’m just not a coral kinda girl. Still, I could judge the pencil’s quality and it’s impressive in that it packs a serious colour punch. In fact, the pay off is pretty much the exact opposite of GOSH’s lippie; if you don’t want sheer and are looking for a bold, opaque lip colour this is it. Thanks to hydrating beeswax, it feels nice and comfy on your lips, like a hydrating lipstick. There’s also the teensiest dash of antioxidant vitamin E in the mix. Like I said, Tangerine Tango isn’t for me but if rubybox every whipped this product out in another hue, say a bright fuchsia, I’d be pretty excited to try it. Next up? TRESemme’ Naturals Nourishing Moisture shampoo and conditioner, R75 for 750mls each. 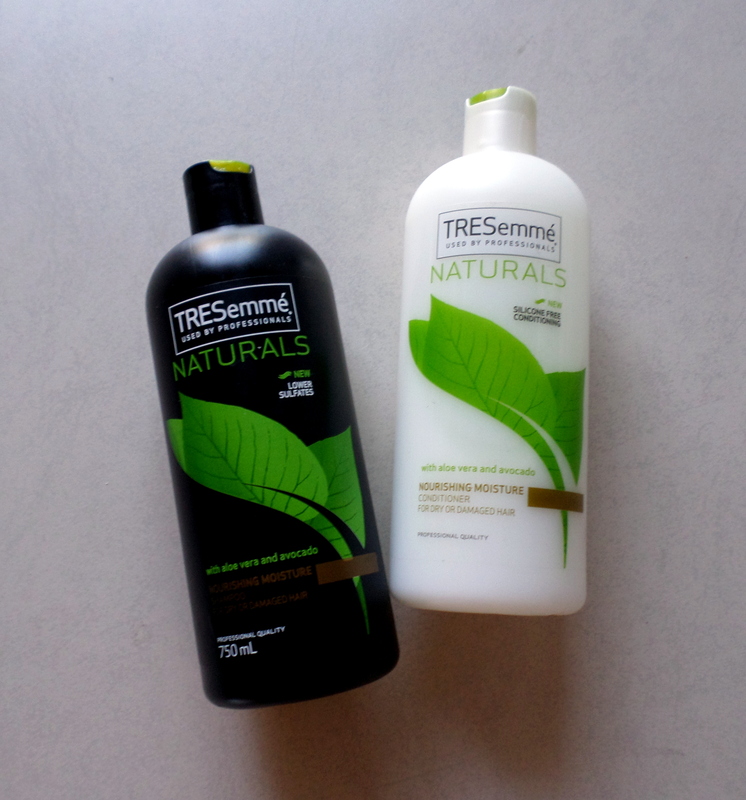 TRESemme’ Naturals Nourishing Moisture shampoo and conditioner. TRESemme’s Natural’s Nourishing Moisture line isn’t all that new but it is new to me in that this is the first time I’ve tried it. While the Naturals Radiant Care line targets those with ‘normal’ hair, Nourishing Moisturise is for those with a slightly drier hair type or anyone who needs a bit more TLC; think highlighted blondes like me. While the shampoo’s low sulphate so it’s less likely to ‘strip’ your hair (great for those who colour), the biggie here is the fact that both products are silicone-free. While I don’t mind a few silicone’s in my sham and con, there are women who have an issue* with them and having this as an option on the shelves is awesome. They also make use of hydrating organic avocado oil and aloe leaf juice but these are listed pretty low in the ingredients list. Your main moisture sources are the (non-drying) fatty alcohols common in just about every conditioner on the shelf. But ja, formulation aside, I like this hydrating duo as they give my fine blonde colour treated hair just enough hydration so that it’s easy to detangle while wet and doesn’t feel weighed down when dry. I also like their fresh, clean, ‘green’-smelling scent. I’m thus very happy to keep them in my shower and rotate them with more hydrating, sleekening, silicone-riddled shampoos to avoid silicone build up without having to resort to a harsh, ‘stripping’ clarifying shampoo. Now let’s chat about Justine’s awesome new tissue oil range. I’ve always known about Justine’s tissue oil but hadn’t realised that the range had grown to become so extensive. You can now buy their tissue oil with SPF 25 (R210), a tissue oil hair mask (R99), a tissue oil body scrub (R99), a tissue oil lip therapy (R115) and the list just goes on and on. In fact, there are seventeen different tissue oil items to choose from! 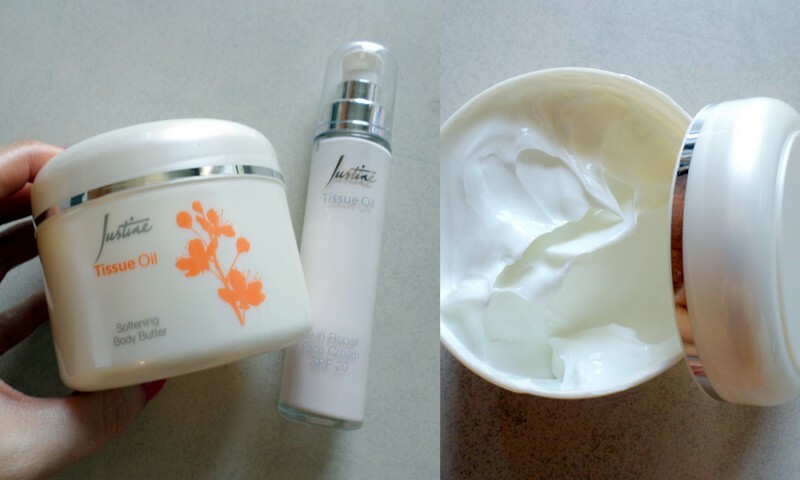 Justine Tissue Oil Softening body butter and Skin Repair face cream SPF20. Of all the items I was sent, I most enjoyed using the Softening body butter (R195). It contains a huge amount of hydrating sweet almond oil and I love how it simply melts into your skin leaving it feeling supple and soft. Also, thanks to the inclusion of collagen-encouraging antioxidants vitamin E and retinyl palmitate, it’ll do a little more than just moisturise. Another goodie? Justine Tissue Oil Skin Repair face cream SPF 20 (R245). A lightweight lotion, it’s also infused with vitamin E and retinyl palmitate plus hydrating rosehip and sweet almond oils. Then there’s the SPF of 20 and the fact that it’s packaged in a nice stable pump bottle as opposed to a jar. All this means Justine’s new face cream is a very viable option if you’re looking for a good daily moisturiser that you can team with a more intensive anti-aging serum should you wish to fend off Father Time. To view Justine’s latest brochures online and get in touch with a rep in your area visit them on Facebook over here. You’ll also find more details on a tissue oil-related Me-Minutes comp they’re running in which you can win a day in the life of a celeb worth R20 000 which includes products, a spa, shopping and fine dining experience plus luxurious overnight accommodation and a Samsung Galaxy S3 mini! So, you see anything you’d be keen on trying yourself? Feel free to chat to me in the comments section below. *Contrary to the popular myth, shampoos and conditioners that contain silicones aren’t bad for your hair. You only get into trouble if the product has a crazy high silicone content. In this case, especially if you have fine hair, it can build up fast, resulting in a coated hair shaft that battles to absorb hydrating ingredients and limp looking locks due to the excess baggage. Still, if you use a clarifying shampoo every couple of days to remove excess silicone, this isn’t going to be a problem. In fact, for the most part, especially for those who have dry or frizz-prone hair, silicone’s a total God send. Great post. Thanks for the helpful reviews.